American political life is continuously generating new concept-defining slogans, for either domestic or international consumption. Even the most cursory examination of the literature about American policy on China reveals the many concepts which have been used to define Sino-U.S. relations: from constructive strategic partnership to strategic competitor; from stake-holder to G2. The past two years has seen President Obama's administration propose the "pivot to Asia" strategy, which then became "rebalancing to Asia." American officials and policy analysts insist that this strategy is not aimed specifically at China. However, both Chinese and American strategists have observed that the rebalancing policy has not only failed to improve relations between China and the United States but also failed to establish their strategic confidence in each other. Some have argued that the lack of confidence (or trust) in bilateral relations is due to what can be labeled the "election effect", when, during times of leadership transition in both countries, the political rhetoric turns somewhat toxic. As a result, the first summit since the most recent elections in both countries carries high expectations for the future of Sino-U.S. relations. The personal relationship and trust between two presidents, Xi and Obama, are expected to help lay the foundations for an enduring and constructive Sino-U.S. relationship, or, in the lexicon of the new political slogan of the times, a new type of "great power relationship" between the United States and China. But forging a genuine new great power relationship requires political will and wisdom on both sides. The real question is: Is there a genuine plan to ensure that this vision becomes a reality? New thinking also should be embraced beyond the concept of a new great power relationship. To achieve this, both sides need to deal more wisely with each other. By doing so, they may avoid the Thucydides Trap described by Professor Graham Allison of Harvard University. The term Thucydides Trap refers to the potential danger which arises when a rising power challenges an existing power. In 11 of 15 such cases over the last 500 years, Allison writes, war followed. Some point, for example, to the existing issues which might ignite conflict between China and the United States, such as the tensions on the Korean Peninsula. The potential for a great power conflict does exist here due to what has happened in the past; however, both China and the U.S. want peace and stability, and the emphasis should be placed on peace. There is indeed the likelihood that the U.S. and China could become entangled in strategic disagreements over what happens on the Peninsula, but such disagreements should not necessarily lead to conflict. The same can be said about the disagreements in both the South China Sea and the East China Sea. Second, there should be greater dialogue across all fields. Dialogue is surely the most effective way of improving mutual trust. For example, the Chinese government values the U.S.-China Strategic and Economic Dialogue (S&ED) because it believes that this mechanism can help improve mutual trust with the United States. Within the framework of this mechanism, more concrete topics, such as disputes over cyber attacks, should be included. Third, due to different history and culture, China and the U.S. do not necessarily share the same views on many issues. Despite their differences over certain concepts, values or ideas, practical thinking on matters of common interest is a way to overcome disputes. Both countries need to clarify their strategies, such as "rebalancing to Asia" or "Chinese dream" in order to take them beyond the conceptual realm. 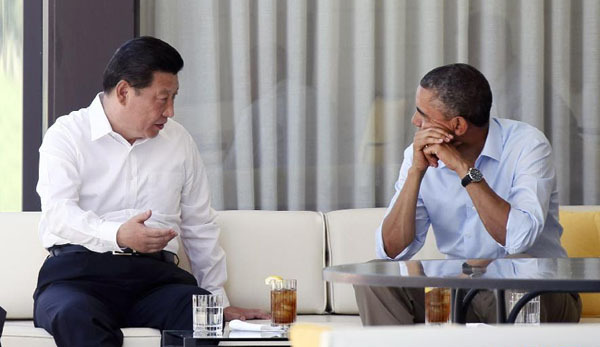 Finally, cooperation and competition are normal parts of any great power relationship. The challenge is to find a way of stabilizing the balance between the great powers in a manner which is mutually satisfactory. In the area of trade, the United States has made China feel frustrated with TPP. While China weighs up the pros and cons of joining the TPP negotiation, the U.S. should be more transparent and positive, especially as more obstacles remain. It is, after all, better to improve cooperation than exaggerate competition. Mutual trust will only come from mutual understanding.